The Tahoe Sierra Snowmobile Club will hold its first meeting of the season on December 6 ,6:00pm, at Tep’s Villaroma Restaurant in South Lake Tahoe. The club meets once a month at various locations around Tahoe, Reno, and Carson City. Your $50 dollar membership in the Tahoe Sierra Snowmobile Club lets you meet other people that enjoy snowmobiling. You also get information about purchasing a snowmobile, getting it serviced, new places to ride, and safety tips. · To promote good fellowship. 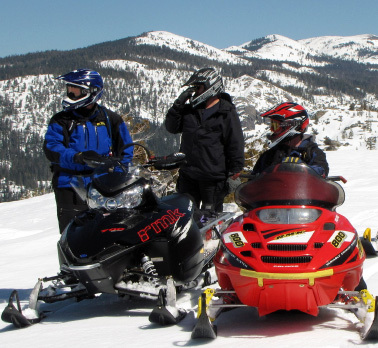 · Promotion of snowmobile safety and public goodwill toward snowmobilers. · To encourage and provide assistance to other snowmobilers. · To provide a voice for the individual snowmobiler. · Positive dissemination of snowmobiling information to the local community. Check the Tahoe Sierra Snowmobile Club website if you would like to attend a meeting or become a member. If you pay your dues before the first club meeting, you could win a SPOT2 GPS Messenger/Tracker. Tep’s Villaroma Restaurant is located at 3450 Lake Tahoe Boulevard, S. Lake Tahoe.